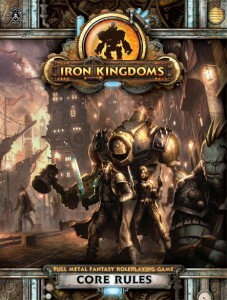 The Iron Kingdoms Role Playing Game is a brand new tabletop RPG system from Privateer Press. In case you guys haven’t been following along with my new-found love for this game I’m gonna break down some quick facts about the game as well as attempt to clear up any confusion that people have had about what it is, and how it works. This post will focus on character creation as well as some overall thoughts on the game so far. First and foremost Iron Kingdoms is not 3.x material like the previous Iron Kingdoms supplements were, it is actually its own game and not d20 material at all. 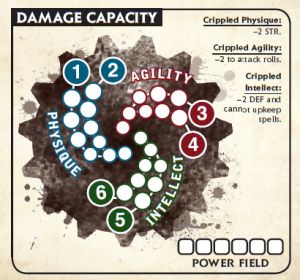 The game uses only d6’s, with a 2d6 roll for its “core mechanic”. The XP system is light and simple, players earn 1 xp for participating in a session, another if the GM thinks they did particularly well with teamwork, etc. and possibly a third if they accomplished a highlight in the story. Of course additional XP can be given out by the GM at any time but this is the basis for progression. They earn additional skills and abilities as their XP increases but character’s don’t necessarily have levels as much as they just have an XP total and a rank such as Hero, Vet, or Epic. The system does use facing during combat but mainly only for elements like back strikes, which is bonus damage applied to striking a foe from behind. All measurement in the game is done in inches, with 1″ representing 6 feet in game. There are a few templates for a few things like grenades and spray weapons so the wargaming influence definitely shows here but Iron Kingdoms does not play like a wargame. 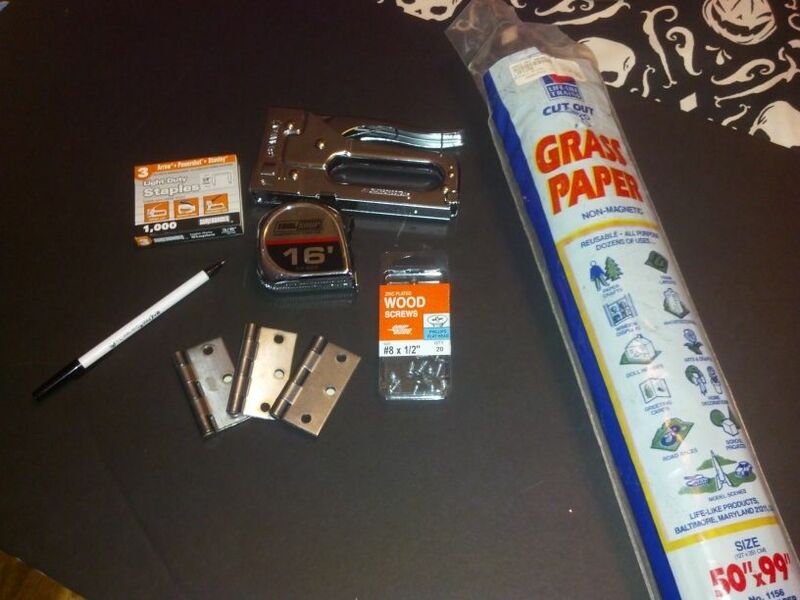 While miniatures of some sort are assumed, you can play the game without them and there is no good reason why you should have to use anything beyond paper cut outs or bottle caps and erasers should you choose. If you are planning on checking out the intro scenario, be sure to download the custom quick reference sheet I made for IKRPG. I made it in an effort to help new players! Characters also have access to what are called feat points. Feat points can be spent to help you manipulate your characters fate as well as give them a myriad of other bonuses and perks. Feat points are acquired by taking down foes, scoring critical hits, and at GM discretion such as for great roleplaying or other deeds of awesomeness. Feat points do cap at 3 though so you spend them wisely, and you spend them often. Beware though, some enemies have them too! Anyway I could ramble more but instead let’s just jump into character creation, most of all of this stuff is outlined within the first few pages of the free intro adventure Fools Rush In, so be sure to check it out. There are several races to choose from in Iron Kingdoms: Human, Dwarf, Gobber, Iosan, Nyss, Ogrun, and Trollkin – each of which has its own starting benefits and an array of stat scores. Some of the races have a restriction or two, but not many. Stat scores are like ability scores in D&D, only in IKRPG you don’t roll for them and they aren’t random because your race will determine your starting scores. Those starting values will be changed before charter creation is done though, as each player will receive 3 points to spend to modify those stats as they see fit, as long as they don’t go over their Hero Limit. Characters in this game start out as Heroes, and as they progress and gain XP they eventually move on to become Veteran Heroes, and then finally Epic Heroes. It sounds a little familiar to 4e’s tier structure, but in IKRPG it has more meaning than a paragon path and an epic destiny as it additionally provides mechanical structure. After you choose your race you’ll fill in details like height, weight and the usual stuff like that, and then move on to archetypes. Gifted – You have the capacity to work magic, and cast your magic via a tradition which is either will weaving or focusing. All magic users are will weavers except for warcasters, who are focusers. The only way for a character to even possess the Arcane (ARC) stat, is to be gifted. Intellectual – Quick thinking, meticulous, and thorough. Intellectual characters work every angle possible when sizing up a situation. 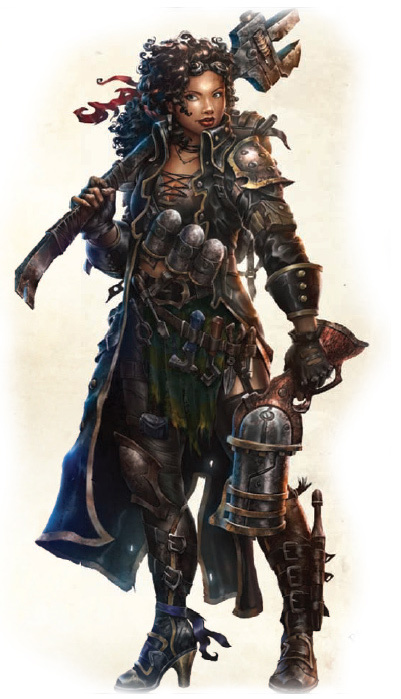 They gain a +1 to attack and damage rolls while in combat and can also grant that bonus to their allies, should they listen to their orders during combat. Mighty – The brutes, brawlers and general action hero style badasses of the game, mighty characters get a bonus die on their melee damage rolls. 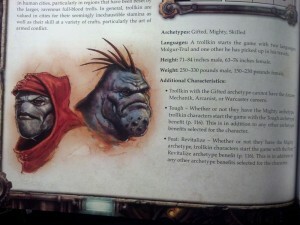 Skilled – The dexterous, lucky, sly, and witty characters of the Iron Kingdoms. Skilled characters gain an additional attack during their turn (if they so choose). Notice that I said careers, plural. In Iron Kingdoms you get to pick 2 careers, which are essentially “classes” to us D&D folk. The fact that you must pick 2 totally enthralls me, as it ensures that a lot of characters really feel unique. Despite what you might think already from reading that certain races have restrictions on archetypes, and certain careers have archetype restrictions I bet you’re thinking that there are sure only a handful of cookie cutter combinations. Well if that’s what you’re guessing I’d like to inform you that you’re dead wrong. There are an absolute ton of combos. Of course I made a gobber Thief/Alchemist because I’m completely unoriginal but it was too awesome to resist. Each career grants you some starting abilities which are like “traits” or “feats” in a sense, skills, and your connections (if any). Connections represent bonds, orders, guilds, and other networks or common ties characters might have. Connections can be gained throughout the game just as additional abilities and everything else but are purely narrative. 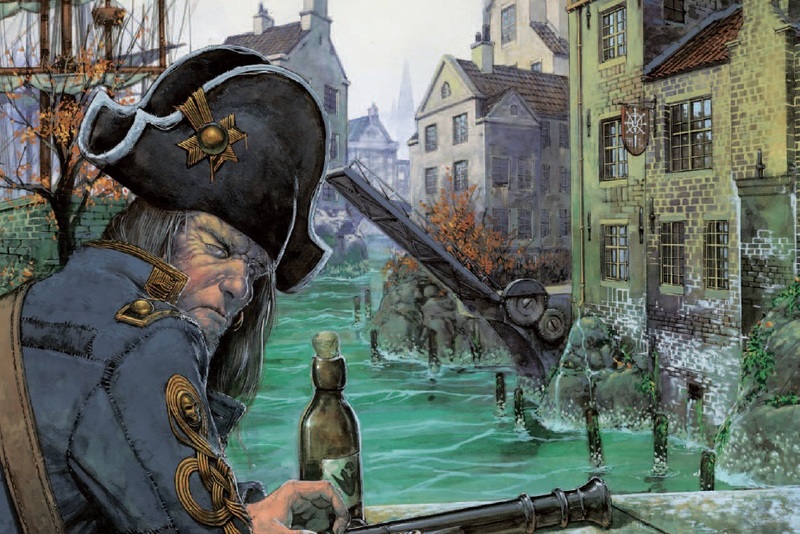 Connections serve to serve as a base line for adventuring parties, perhaps even entire campaigns. Maybe the characters are all pirates or affiliated with an arcane order. Connections also serve as a great way to avoid the cliche “okay, everyone starts in a tavern…” kickoff sessions. There are actually a lot of really great narrative threads placed all throughout the IKRPG character creation process without being beaten over the head with them. I’ve not touched on them all but I will in my full review when the time comes. I won’t be delving into the innards, (skills, abilities, connections, etc.) of every class in the book but I will rattle them all off for you to use your imagination on, and start dreaming up awesome combos. Here goes: Alchemist, Arcane Mechanik, Arcanist, Aristocrat, Bounty Hunter, Cutthroat Duelist, Explorer, Fell Caller, Field Mechanik, Gun Mage, Highwayman, Investigator, Iron Fang, Knight, Mage Hunter, Man-at-Arms, Military Officer, Pirate, Priest (of Morrow or Menoth), Rifleman, Soldier, Sorcerer, Spy, Stormblade, Thief, Trencher, Warcaster. Before filling out your life spiral you’ll spend those 3 points that I mentioned earlier to increase your stats however you want. Characters in IKRPG don’t have your typical “hit points”, and although the life spiral can look a little confusing at first glance it’s really very simple. Above in the stats section you should have noticed the image with your 3 primary stats, each has derivative stats but those 3 primary ones are what designate your life spiral. If you have a Physique stat of 5, you would color in enough of the Physique circles so that only 5 were left and follow the same with Agility and Intellect. When you take damage, a d6 is rolled and that determines which spiral you lose vitality points in. Once an entire aspect of your vitality points are marked off, you become crippled in that area. If you become crippled in PHY, AGI, and INT you are disabled and possibly grievously injured which can lead to death. Regaining vitality points will make those effects go away, as will healing, and you can always use some of your feat points to get out of trouble! After an encounter you regain vitality points = to your Physique (PHY) stat. 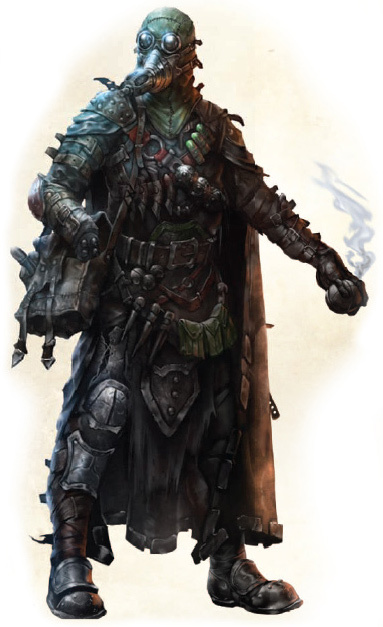 Flesh out your character with connections, gear, and a steamjack if applicable. There’s a whole section of the book dedicated to alchemy, gear, steamjacks, and more. There’s not much to really go over here beyond looking at all of the awesome stuff the Iron Kingdoms universe has to offer and spending your coin on it. If you’re more interested in the game you can listen to our actual-play podcast we’re putting together from our first session running Fools Rush In. The first part is already up, the second and third parts will also contain some commentary on what took place during that segment and some of our opinions on the game as well. I really can’t speak enough as to how much I’m enjoying this game. The world is familiar but different, and it’s so rich with ideas. Browsing any page seems to give me a at least 3 or more good ideas for an adventure or an entire campaign. I don’t think Iron Kingdoms is meant to be a one size fits all RPG like D&D, but if you could see yourself getting into this ‘fantasy RPG meets industrial revolution’ style setting I say you should jump in ASAP. I hope you’re enjoying my discovering of a new game as much as I am. Sorry I can’t write about D&DNext non stop but the nature of my D&D writing is to create things and play with mechanics and ideas, I can’t do that right now because of the NDA. I’m actually very thankful for that because this game and so many others I’ve played lately have really opened me up to new things and I’m enjoying the hell out of myself. I hope you are too. Until next time! Looks very cool. I put the Core Rules book on my wishlist. It would probably be hard to get my group to play it though…we are entrenched in DnD 4e right now. Hopefully, I can get them to switch to DnDNext when it comes out. You should start trying D&DNext right now with your group! Maybe not as a replacement campaign but at least to test the waters with a one shot or side adventure or something. See how they like it. Also, you could run the intro IKRPG stuff for them as a one shot too, the Fools Rush In adventure takes 2-3 hours tops. I love the Iron Kingdoms setting, and have all the 3.x books. I also play Warmachine and Hordes, so know a little bit more than your average (non-Iron Kingdoms-inducted) gamer about the setting. The only thing that turns me off about the game is the price, though I’m sure I can find it cheaper on Amazon. That being said, these are great. I love the fact that I can get a good feel for the game just by reading your blog. Thanks! Definitely, Amazon to the rescue as always! I’m glad you can get a feel of the game just from reading here, that’s what I’m trying to accomplish. Thanks for reading & commenting! Thanks for the information. Our GM shared this page with us. I’ve exhaustively read through the core rulebook myself before ever reading this, but it’s the link im sending to my friends so they don’t have to listen to me blather. Well written, concise, and evocative . Thanks! Thanks! I came back and cleaned up the broken links and shortcodes thanks to this comment. Also updated the Quick Reference sheet mentioned up top. I hope they enjoy the game and this all gets put to good use!